“Animal Crackers in my Soup” may be on the verge of extinction as Hollywood mourns the loss of one of their career darlings, Shirley Temple Black. Temple died of natural causes on February 10, 2014 at the age of 85. While entertainers and audiences alike grieve the passing of their round-cheeked, curly-haired star, Temple’s legacy lives on. In a nation recovering from the Great Depression, Shirley Temple’s giggling charm was a welcome addition to the Hollywood scene of the 1930s. Temple began working in entertainment at the ripe old age of three, landing her first main role in “Stand Up and Cheer” in 1934. From then, Temple was cast in 28 movies over 10 years, grinning, singing and dancing her way across a second world war and into the hearts of American viewers. Some of Temple’s most recognized films include “Bright Eyes” (1934), “Curly Top” (1935), “Dimples” (1936), “Heidi” (1937) and “The Little Princess” (1939). 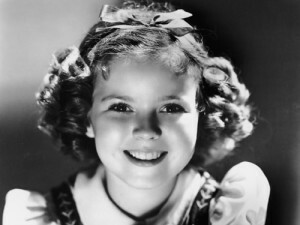 My first contact with Shirley Temple came during a Christmas many years ago. It was so long ago that VHS tapes were still considered stellar presents. That year, my grandma gave both me and my older brothers one VHS each. While my brothers opened a skateboarding music video and some Focus on the Family cartoon, I unwrapped “Poor Little Rich Girl” starring, you guessed it, Miss Shirley Temple. My six-year-old self tried very hard to enjoy this present. Despite my best efforts, I fell asleep every time I tried to watch the movie. However, I distinctly recall seeing this famous little girl and wishing I had her curly hair and ability to sing in everyday life. Although I have grown up and can keep my eyes open through many a classic film, what I noticed about Temple as a child was much of what America loved about her in her prime. Yet, there was more to this charming child actress. In addition to an endearing presence and talent, Temple, as one writer at The Chicago Tribune notes, was a model of childhood stardom. The actress began her career at an extremely young age, a common characteristic for kid-entertainers. However, what distinguishes Temple from her modern day counterparts (think Cyrus, Bieber, Culkin or Spears) was her ability to diversify when her work began to disappear. Throughout her career, Temple maintained a fairly singular image and when audiences no longer clamored to the box office for this image, she moved on. While the young girl maintained a modest resume of TV shows and small films as she grew up, Temple was able to exert her influence in other areas. She had a fairly normal adolescence, married and had three children well out of the spotlight. Eventually, the darling of Hollywood turned international diplomat, serving as Nixon’s ambassador to Ghana in the 1970s and George H.W. Bush’s ambassador to then Czechoslovakia in the 80s. Temple, in this regard, is a stunning example of enjoying celebrity status while maintaining credibility. Initially famous for her ringlets and sing-along tunes, Temple came to be respected as a significant political player and spokesperson for many causes. Hollywood may mourn the loss of a young starlet, but I am grieving the example she set for talent that exemplifies self-respect, dignity and class.